Crested geckos were once thought to be extinct, but were "rediscovered" around 1994. Since then their popularity as pets has continually increased. They're very low-maintenance pets, and are well-suited for children or novice lizard owners. Life Span: Crested Geckos are expected to live 10-20 years though they are relatively new to the reptile hobby so this is a bit uncertain. Crested geckos come in a wide array of colors and markings (morphs). They get their name from the fringed crest that begins over their eyes and runs down their necks and backs, though the size of the crest varies. 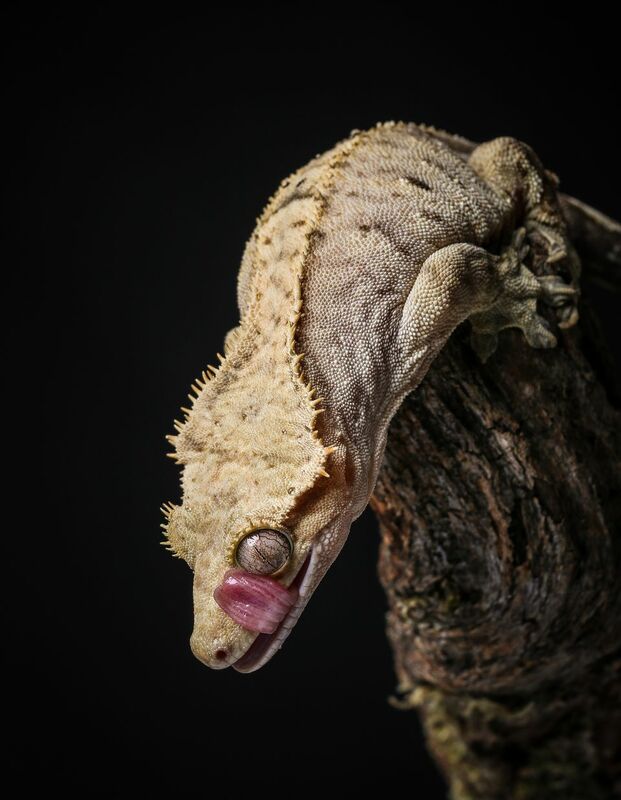 Crested geckos have specialized toe pads that allow them to effortlessly move along vertical surfaces and their prehensile tails add to their agility. They are also good jumpers. Crested geckos usually have fairly docile temperaments, though they can be a bit skittish and care is required when handling; they may try to jump away from you and be injured. Also, crested geckos may drop their tails if handled roughly or to attempt to get away, but unlike other geckos, they will not regenerate their tails. A minimum of a 20-gallon tall terrarium is sufficient for an adult but a larger tank is better. Crested geckos are arboreal, active, and need lots of vertical space for climbing so a tall tank is preferred. 2-3 crested geckos can be housed in a tall 29-gallon terrarium (but males are territorial so keep only one male per tank). A glass terrarium with a screened side for ventilation can be used but some keepers prefer screened enclosures. Crested geckos need room to climb, so provide a mix of branches, driftwood, cork bark, bamboo, and vines at a variety of heights and orientations. Add a variety of silk and/or sturdy live plants (pothos, philodendron, dracaena, ficus) as they will hide in the plants for cover. A small shallow water dish can be provided, with fresh water daily, though they will likely prefer to drink water droplets from leaves (mist the tank every evening). The substrate for crested geckos should be something that retains moisture to aid in maintaining humidity levels such as coconut fiber bedding, moss, or peat, though paper or paper towels can be used as well. Crested geckos are somewhat prone to ingesting substrate while hunting; if this is the case for yours, use moss (either alone or over another substrate like coconut fiber) or paper towels. Paper towels are recommended for juveniles as they are more likely to accidentally swallow other substrates. A daytime temperature gradient of 72-80 F (22-26.5 C) should be provided for crested geckos with a drop at night time to 65-75 F (18-24 C). Crested geckos get stressed at higher temperatures. A low wattage red night-time bulb makes a good heat source. Do not rest a heat source right at the top of the tank as these climbing geckos could get too close and burns could result. Crested geckos are nocturnal so they do not need special UVB lighting. However, some experts feel providing low levels of UVB lighting is still beneficial to their overall health (one must make sure the enclosure does not overheat and that the geckos can hide from the light if desired). A red night time bulb allows viewing when they are most active as well as providing some heat. Crested geckos need a moderate to high humidity level; aim for 60 to 80 percent relative humidity (get a hygrometer and monitor levels daily). Provide humidity with regular misting with warm filtered water. Depending on your cage set-up you may need to mist it a few times a day to keep the humidity up. Always make sure the cage is well-misted at night when the geckos are most active. Crested geckos will likely drink water droplets on leaves that are left from the mist. A commercial crested gecko diet is usually well accepted and is the easiest way to ensure a well-balanced, nutritious diet. It can be supplemented with crickets and other prey insects (roaches, waxworms, silkworms; mealworms are best avoided due to their hard exoskeleton) for variety and to allow the gecko to exercise his hunting instincts. Any insects fed should be slightly smaller than the space between the gecko's eyes, should be gut loaded prior to feeding and then dusted with a calcium/vitamin D3 supplement. If you can't get a commercial gecko diet you can feed crested geckos a combination of insect prey items and fruit though it is more difficult to feed a balanced diet this way. The insect portion of the diet can be made up mainly of crickets with the occasional addition of other insects for variety. Prey should be smaller than the space between the gecko's eyes, be gut loaded prior to feeding, and dusted with a calcium/vitamin D3 supplement two to three times a week and a multivitamin once a week. Feed as much prey at one time as the gecko eagerly eats. Crested geckos can eat fruit several times a week as well. Try mashed fruit or jarred baby food; they often like bananas, peaches, nectarines, apricots, papaya, mangoes, pears, and passion fruit. Feed crested geckos in the evening; juveniles should be fed daily but adults do not need to be fed every day (three times a week is recommended by many keepers). Crested geckos are one of the most commonly sold gecko varieties, largely because they are so easy to care for and have such sunny dispositions compared to other lizards. Even though they're widely available at pet stores, try to get your crested gecko from a reputable breeder if possible. A healthy gecko doesn't have visible ribs or pelvic bones. They don't like to be handled, so avoid it if possible. And while they rarely bite, they may do so if stressed. A crested gecko bite is not of much consequence. Many geckos are susceptible to mouth rot, or stomatitis, and crested geckos are no exception. Symptoms include excess mucus and redness around the mouth. If you notice your gecko is wheezing or drooling, these are signs of a possible respiratory infection, another highly common gecko ailment. When your crested gecko has what looks like a rash, it may be a sign of parasitic infection; another symptom is difficulty shedding its skin.